CornerChaos is a unique puzzle game! It's very easy to learn and great fun to play! The object of the game is to drop the colored balls into the holes located near the four corners of the play area. The ball then rolls into the sloped arena and lays to rest. If four balls of like color are touching, they're removed from the game! As the levels progress, the number of different balls increases making it more difficult to create color groups. A fun and addictive rolling balls puzzle game. 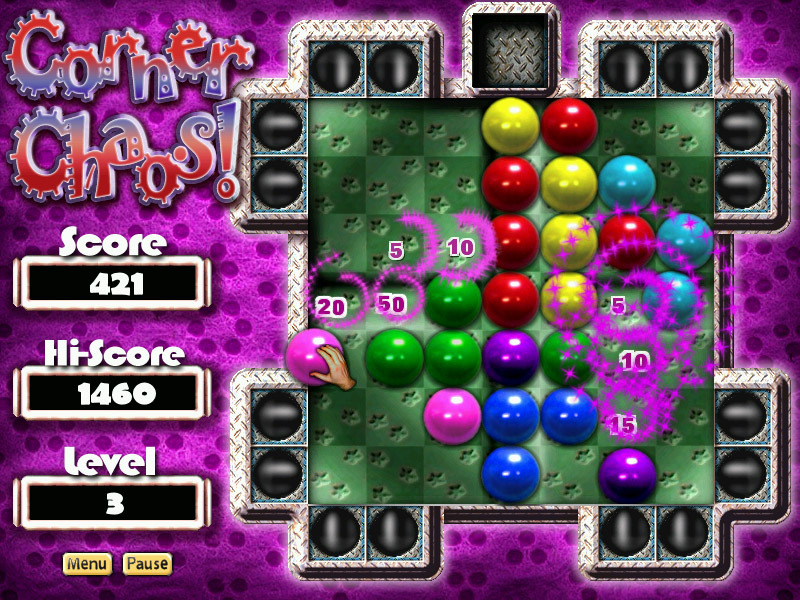 ...... As the levels progress, the number of different balls increases making it more difficult to create color groups. With no time penalties you can play the game at your own pace. The controls are very easy to master; this is a most relaxing game for all ages! Qweas is providing links to CornerChaos 2.1.6 as a courtesy, and makes no representations regarding CornerChaos or any other applications or any information related thereto. Any questions, complaints or claims regarding this application CornerChaos 2.1.6 must be directed to the appropriate software vendor. You may click the publisher link of CornerChaos on the top of this page to get more details about the vendor.